We had an exciting morning today. Mr. Iwasaki, one of the station managers at Radio Tsukuba (84.2 FM), came to visit our Grade 3 class. The students interviewed him as an expert about radio for their unit of inquiry on “communication”. The students were all very excited and surprised when he invited the whole class to Radio Tsukuba headquarters to watch and maybe be a part of a live radio show! Not only that, but he agreed to broadcast the radio shows that the students are making on various modes of communication as a part of their studies. This is a wonderful opportunity for our students. It is also a great way for the students to learn about modern communication systems and really put their hearts into creating something original, English language-based, and unit-based for radio broadcasting. Maybe one of our students will grow up to be a DJ! 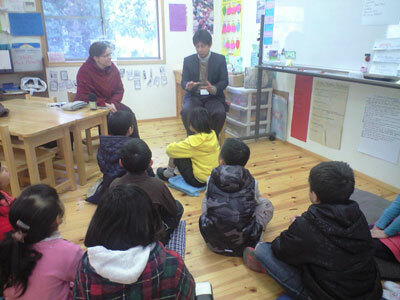 Just before Mr. Iwasaki arrived, the students were singing The Green Grass Grew All Around, a popular children’s song where the verses get longer and longer. You can hear the kids singing the last two verses of the song here. You can listen to Radio Tsukuba live from anywhere in the world (with an internet connection) at this link. Please tune in on Mondays from 7:30pm to 7:45pm to listen to the TIS show every week. The Grade 3 shows will be airing in February.